Since 1968 Glenmarc Industries, Inc. has been providing accurate and reliable alternatives to manual dispensing, metering and mixing applications. Our precision dispensing systems are universally accepted and are operating in many production facilities throughout the world, from small size shops to the industry giants. We design, engineer, and manufacture at our facility in Chicago Illinois USA all the machines and equipment we sell. We are not just another distributor who sells out of large "catalog" of someone else’s equipment with limited knowledge of each, we are the original equipment manufacturer. We fully support all our machines and equipment with parts and service long after the sale is made. We have engineers that can help you design a fluid dispensing system or select an adhesive material. We are easy to talk to, we have over 40 years of adhesive and fluid machine designing experience. We are small enough to give you personal engineering service but large enough to service your most challenging needs. We ship all spare parts and dispensing components the same day we receive your order. Our product line includes: Automated and manual meter, mix, dispense systems for two component material applications. 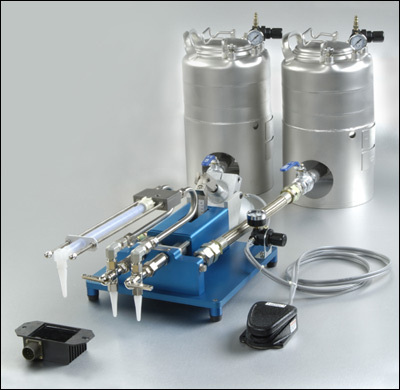 Bench-top fluid dispensers, adhesive dispensers, and material dispense valves. Automated XYZ robot dispensing systems. A full line of dispensing components such as syringes, pistons, dispense needles, hand syringes, cartridges, mix tubes, and dispense tools. 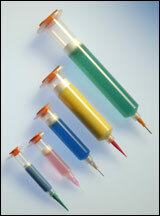 We also can engineer and design any custom dispensing systems you may require. Glenmarc completes your application needs by offering a full line of potting epoxies, adhesive epoxies, repair epoxy putty sticks, epoxy and polyurethane coloring pigments, polyurethane cast resins, cyanoacrylate and anaerobic adhesives. Contract filling services, custom formulations, and private labeling available.